HVAC Service - Learn about Our Company | Air Temperature Control, Inc.
Air Temperature Control, Inc. is owned and operated by Chris Lewis and Jeff Modica. We are licensed and insured, function in a timely manner, and strive for efficiency in everything we do. At Air Temperature Control, Inc., we have over 35 years of experience helping people beat the heat of summer and the deep freeze of winter. 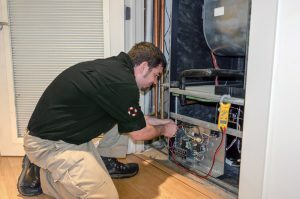 We specialize in AC installation, furnaces repair, installing air purifiers, humidifiers, UV germicidal lights, and more, as well as the repair of existing units. New HVAC installations come with a free estimate and a 10-year parts warranty and we service all makes and models. Air Temperature Control, Inc. is committed to business integrity and honesty through dedicated effort. Communication with our customers and a willingness to evolve with the industry are what set us apart from the competition. We believe that satisfied customers fuel our success. With continued dedication to the trade and the customers it serves, we’re sure to continue being the business that Belleville residents know and trust for all of their HVAC service needs. Air Temperature Control, Inc. is an Authorized Comfortmaker and AprilAire Dealer. All Comfortmaker equipment is backed by a 10-year warranty. For the professional service or installation of a new or existing air conditioner, furnace, whole-home humidifier, air purifier, or other HVAC equipment, contact the experts at Air Temperature Control, Inc. today for a free in-home assessment and estimate. We service Romulus, Ypsilanti, Canton, Ann Arbor, New Boston and the surrounding areas.